Smart Solar 20622R01 Country Gardens Solar Birdbath Fountain, Gray Weathered Stone Finish, Designed For Low Maintenance and Requires No Wiring or Operating Costs. Some electrical items might not work outside USA! Low maintenance: simply drain, wipe down, rinse and refill. Construction: glass fiber reinforced concrete (GFRC). Patented underwater integral solar panel and pump system. Recycles water from a hidden reservoir. No wiring, simply install and enjoy. Weight: approximately 35 lbs; Water Capacity: 1 Gallon. The Country Gardens Solar Birdbath creates a soothing and relaxing atmosphere on your patio, deck, balcony or in your garden. 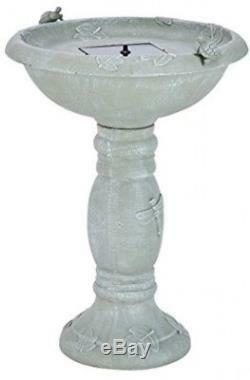 It comes in an elegant weather stone finish and features two turtles on the bowl's edge (removable if desired). Two fountain heads are included, allowing you to switch between a bubbling and umbrella spray feature. Established in 2002, Smart Solar offers a wide selection of exclusively solar powered products. We design, manufacture, and customize all of our own items for your patio and garden. Enjoy our solar powered, energy efficient, and nature friendly lighting solutions, water features, and outdoor decor. We are confident you will love solar living - that's why we've been creating solar products and growing the solar lifestyle for nearly 15 years. Please consider holidays & weekends. Please send us a message for a quote. 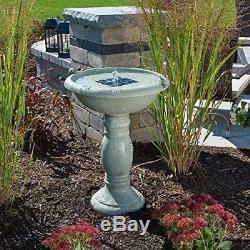 The item "Smart Solar 20622R01 Country Gardens Solar Birdbath Fountain, Gray Weathered No" is in sale since Wednesday, August 8, 2018. This item is in the category "Home & Garden\Yard, Garden & Outdoor Living\Bird & Wildlife Accessories\Birdbaths". The seller is "floyd_arquea" and is located in Van Nuys, California. This item can be shipped to United States, Canada, United Kingdom, Denmark, Romania, Slovakia, Bulgaria, Czech republic, Finland, Hungary, Latvia, Lithuania, Malta, Estonia, Australia, Greece, Portugal, Cyprus, Slovenia, Japan, China, Sweden, South Korea, Indonesia, Taiwan, South africa, Thailand, Belgium, France, Hong Kong, Ireland, Netherlands, Poland, Spain, Italy, Germany, Austria, Israel, Mexico, New Zealand, Philippines, Singapore, Switzerland, Norway, Saudi arabia, Ukraine, United arab emirates, Qatar, Kuwait, Bahrain, Croatia, Malaysia, Brazil, Chile, Colombia, Costa rica, Dominican republic, Panama, Trinidad and tobago, Guatemala, Honduras, Jamaica, Antigua and barbuda, Aruba, Belize, Dominica, Grenada, Saint kitts and nevis, Saint lucia, Montserrat, Turks and caicos islands, Barbados, Bangladesh, Bermuda, Brunei darussalam, Bolivia, Ecuador, Egypt, French guiana, Guernsey, Gibraltar, Guadeloupe, Iceland, Jersey, Jordan, Cambodia, Cayman islands, Liechtenstein, Sri lanka, Luxembourg, Monaco, Macao, Martinique, Maldives, Nicaragua, Oman, Peru, Pakistan, Paraguay, Reunion.